Beatitude is a brand I have been following for a while now, founded by Rebecca Connor a Beauty therapist and Aromatherapist with over twenty years experience. The first products from the range that caught my eye were the stunning looking bath oils in beautiful glass bottles, these are so beautiful it would be a shame to use them. The bath and body oils are all made with a blend of oat, camellia and peach kernel oil to hydrate and beautiful essential oil blends. I tried a small sample of the Joy body oil from a beauty box and I loved the vibrancy of the oils used and feel of the product. 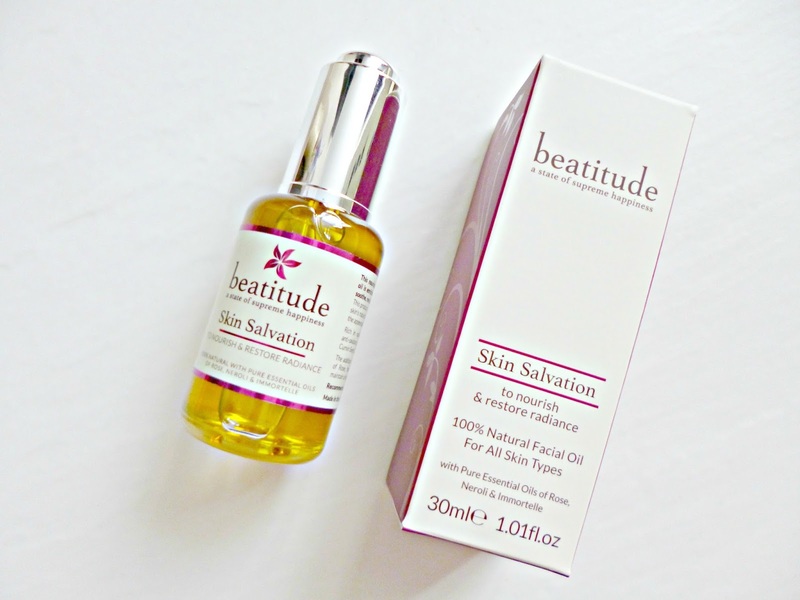 I have been trying the beautiful Skin salvation oil (£38 for 30 mls), this oil is designed for all skin types but I think it is especially beneficial for dry and sensitive skins like mine. The blend contains, peach kernel oil, coconut oil and oat oil. Oats are especially soothing and coconut is brilliant for moisturising although sometimes problematic for acne prone skins. The blend also contains Daikon radish and black cumin oils which I thought were interesting additions. The essential oils of Neroli, Rose and Immortelle give it a beautiful soothing scent, slightly spicy with a floral undertone. I love facial oils and my skin drinks this one up, although I haven’t been using it for long enough to comment on the long term benefits I am really impressed by both this blend and what Beatitude have to offer. I have been using this as a night time oil, it is lovely and softening and nourishing on the skin and I have been using it either alone or layered with moisturiser.